The College of Veterinarians of British Columbia (CVBC) has banned the practice of partial digital amputation, also known as onychectomy or declawing, of domestic cats, effective immediately. 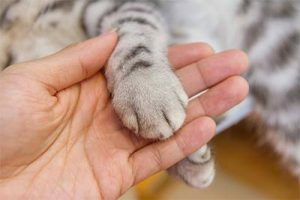 The province is the second in Canada to ban declawing, following the procedure’s condemnation from the Canadian Veterinary Medical Association (CVMA). “Elective and nontherapeutic declawing is ethically problematic and not an appropriate means of dealing with feline behavior issues,” reads CVBC’s statement. The college acknowledges there are medical conditions that may necessitate partial or full digital amputation as an appropriate medical therapy, such as biopsy for diagnosis, severe trauma, or medical conditions affecting the health of the nail (i.e. onychodystrophy, paronychia, neoplasia of the nail bed/phalanges), but adds there is no medical condition or environmental circumstance of the cat’s owner that would justify declawing. While CVMA does not regulate veterinarians in Canada and cannot enforce a nationwide ban, the association announced its opposition to elective and non-therapeutic declawing last March, declaring the practice “ethically unacceptable when performed without comprehensive client education including a thorough review of available alternatives, as the surgery has the potential to cause unnecessary and avoidable pain.” Such alternatives include non-surgical measures (i.e. regular nail trimming, artificial nail covers) and behavioral changes (i.e. use of feline pheromone sprays, daily play to decrease aggression). To read more about CVMA’s stance, click here.